​In 2018, Our Neighbors’ Table declared the City of Amesbury as a food-secure community after more than four consecutive years of meeting the food needs of its residents. 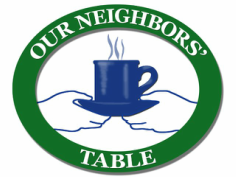 Our Neighbors’ Table has made recent investments and an ambitious 2020 Strategic Plan to make it the only organization poised to implement a near-term strategy to end hunger in Northeastern Essex County. To help achieve the goals of ONT’s 2020 Strategic Plan, ONT established a regional Food Security Advisory Group (FSAG) encompassing local political leaders, human service organizations, health care providers, educators, and the individuals we serve. This group has a shared resolution to make food security in northeastern Essex County universal. The FSAG is ONT’s vehicle for implementing change and expansion across our region. We believe using a collective approach will be the most effective and lasting catalyst for change. Carry out community-wide food security assessments to identify where, for whom, and why food insecurity continues to exist. Formulate key strategies to alleviate and/or eliminate barriers to accessing food that build on proven methods and that address the root cause of the problem (including this project). Identify short and long-term activities, goals, and metrics to measure our impact in increasing food security. Share lessons learned to replicate successes across our service region, across the state and the nation. This approach supports our goal of keeping programs effective by engaging people who use our services in their implementation, as well as local service providers and stakeholders to create a community consensus for positive change. The initial phase of our regional assessment launched in June 2018, this will inform how we, as a collective, can build upon proven models and create new strategies to ensure individuals and families do not fall through the cracks. This plan to implement healthcare provider-based food insecurity screening is a bold first project along ONT’s Strategic Plan and the FSAG’s goal to ensure universal food access.